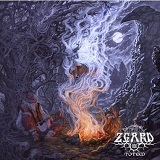 A few years ago when I picked up the first album I ever heard by Zgard, Contemplation, some have been accusing one-man Ukrainian metaller Yaromisl, who is the force behind Zgard, of being too much folk and not enough metal. Frankly, I did not feel the lack of heaviness in Contemplation, but now as prolific Yaromisl unveils Totem the same accusers will have absolutely nothing to complain about. Maybe Yaromisl wanted them proven wrong one more time, or maybe the dedication of the album to Veles, a very shady god in Slavic mythology, led to the feel in the music, or maybe the turbulent times Ukraine is going through inspired the album. I certainly would not know, but Totem is now full on atmospheric black metal. So, is this entirely a good thing? The answer is of course in the eye of the beholder. After the ghost gathering in Dismal Visions, Zgard does not waste any time to unveil shrill vocals, savage riffs, lots of blasting and exploding double bass in Land of Legends. Trademark sopilka (native Gutsul wind instrument) peeks from underneath a few times, but it is not called upon anymore to carry the melody along, raging riffs do that instead. And this pretty much remains the trend throughout. I cannot say that the folk side of Zgard is subservient on Totem, but it often has to go against strong and uncompromising feel of the newly found power and assertiveness. The title track may have the unambiguous melodic opening, but the anxiety and unease take over soon. It is if passion completely consumes and burns Yaromisl up. He has a lot to say, riding the non-stop tremolo movements, so vocals are plentiful as well, and the tracks grow long. The second part of the title track is more melodic, expansive and keyboard laden, but I can't say Zgard eases off the throttle there either. Even when the melody comes out in Descendants of the Thunder, it is some sideways tubing sound, uncomfortable, produced by the big horns I saw when visiting Carpathian Mountains area long time ago. The individual shrill vocals do not give in to the stately chorus of tired warriors, and while mid-song the pace changes and female voice provides momentary ambient relief, the violence rages soon after that. The beauty of the 1st minute opening of Forgive Us Nature is destroyed by bulldozing pulverizing attack, moaning howls trying to emerge from underneath and plead for lost beauty. The sad howls drown it all away, realizing all is lost, in a final act of pillage. In this sense, the titles of songs in Totem are very fitting. Sorrow feels like it is all about the irretrievable loss, nature would hardly forgive in Forgive Us Nature after all it endured, and Dark Lord of the Carpathians, after good double bass pummeling, proceeds to be a slower dragster with wild gyrating mysterious dances. There is pretty much no letup in Totem and it isn't until past midway of the album that the pace slows down a bit and Zgard unveils Xasthurian Sorrow, which goes only heavier and more distressed as it develops. There is no doubt that with Totem Zgard put together a quality atmospheric black metal album, but somehow during that process the band began sounding more “typical”. Totem may bring Zgard wider appeal, but made the band less personal to me. What makes Totem songs unmistakable Zgard, something I could listen to and recognize immediately? Also, Totem brought a lot of intensity from the band, and while I can provide a resounding “yes” to that approach, somehow along with intensity came discordance, a quality I am not ready to accept yet from Zgard.